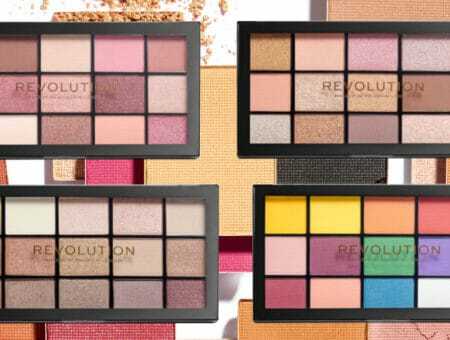 I recently read something by Julie over at xoJane: Her comment was that she gauges how effective a beauty product is by how many compliments she gets while wearing it. We all kind of do that, right? I mean, I know that if someone tells me they like my lipstick, I’m much more likely to wear it again. In the past three weeks, every single person I’ve talked to has commented on how tan I am. My “normal” foundation shade is Revlon 001-Ivory. Yet, I am also able to naturally tan – albeit slowly. Because skin cancer runs on both sides of my family, I’m done with ‘authentic’ natural color. Bring on the SPF 50. Problem is, I still prefer the way I look with a little sun. And this tan that everyone is commenting on? Yep, it’s from a bottle. No, a good self tanner will not turn you into an Oompa-Loompa. Yes, it can be sort of messy. No, it’s not (necessarily) expensive. Yes, the color looks real. 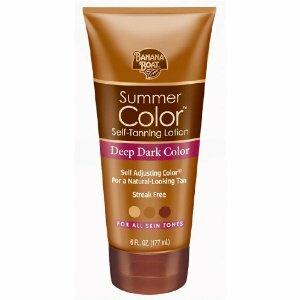 I wrote a whole tutorial about this tanner a few summers ago. It’s messy and expensive but gives the absolute best, darkest color. 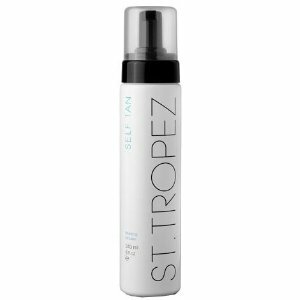 If you’re looking for a super dark, believable tan after one application, then St. Tropez’s lotion is your goldmine. These days, it seems as if every single lotion also has a gradual self-tanning option. Usually, though, they’re orange or smelly or not moisturizing. L’Oreal’s option, however, smells awesome, is a great moisturizer and will give a realistic color in 4-5 days. Remember that this does have a tanner in it – I swear, the lotion itself is so good and non-self-tanner-smelling that I forget – so use sparingly on your ankles, elbows and knees. 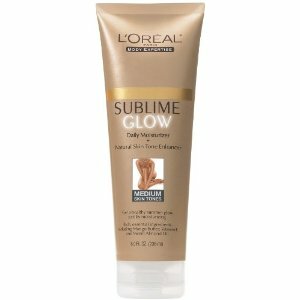 If you’re looking for a gradual, light tan without the mess, stock up on this ASAP! I love the St. Tropez brand, but it’s definitely a strain on my wallet. That’s why Banana Boat’s lotion is a godsend. For less than the price of 2 lattes, you get a fairly dark, realistic color. Fair warning: If you’re not careful and don’t rub it in all the way, it can come out streaky. This can look a bit orange after two consecutive applications, but it’s plenty dark after the second anyway and I don’t see why you’d need three. At $7, this is definitely worth the two Starbucks trips you’ll skip. If I were to only use one self-tanner for the rest of my life, it would be St. Tropez’s mousse. It’s so, so easy to use. It dries fast enough so that you can wear clothes over it less than 10 minutes later but the product is forgiving in that it won’t dry before you’re done rubbing it in. A few weeks ago, a tan application looked incredibly streaky on my legs the next morning. (Note: exfoliate thoroughly before any application!) I applied the mousse, hid my legs under a long skirt and went on my way. 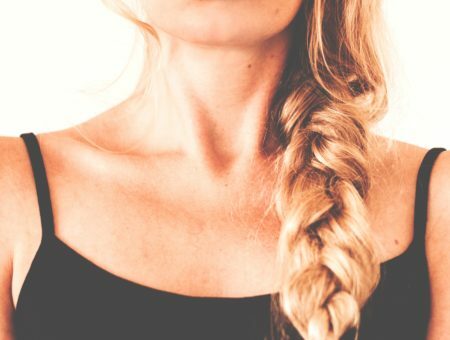 A few hours later, I was telling a friend about it and lifted the hem of my maxi skirt – instead of a streaky mess was an even, dark tan. 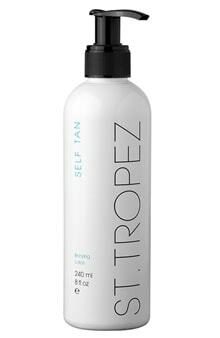 If you’ve never used self-tanner before, get this St. Tropez mousse – and in the big size, because it’s that good. Self-tanning your face can be really frustrating. I usually mix 1/3 face lotion with 2/3 self tanner, but it always fades before the rest of my body. 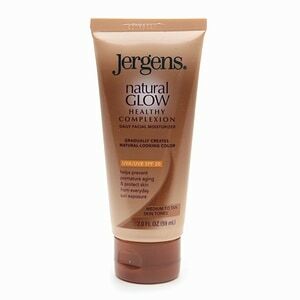 To counteract that, I moisturize in between with this Jergens Self Tanner for Face. It’s a lightweight, face-safe moisturizer that gives a believable color – what else could you want? It seems like every time I walk into CVS or Walmart, all the products that I want are out of stock. 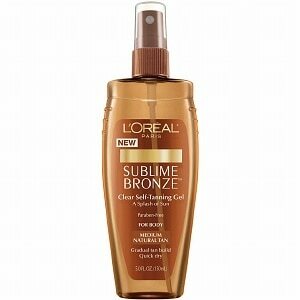 L’Oreal’s Sublime Bronze Self-Tanning Gel, though, is always in stock, even in the winter. If you’re in a pinch, this is a tanner you’ll be able to find. The gel is clear, so if you’re not in good light, it can be hard to put on. It also dries fairly quickly, which is great if you want to get dressed right after but can make rubbing it in, well, a bit tough. The color, though, is not orange-y at all. Plus, some of the aforementioned beauty writers at XOJane love it too. And, it’s only about $11. Not bad, right? Do you use self-tanner? Which one is your favorite? Least favorite? Let me know in the comments!